Guatemala food and drink is primarily influenced by the country's Mayan and Spanish cultures. However, it also received influences from African and Caribbean cultures. Nowadays, is food is a mixture of tons of different international influences such as Chinese, American, and the vegetarian movement. Ready for a taste of Guatemala food? Be sure to follow the links for Guatemala recipes and other information about Guatemala food and drink. Guatemala breakfasts are simple, typically including an assortment of eggs, tortillas, beans, and plantains. Some are also served with some cheese or cream. Many breakfasts in Guatemala take advantage of the country's abundant tropical fruits, like bananas, papaya, mangoes, and avocado. In some places, you might even get some oats. And of course, no Guatemala breakfast is complete without a mug of world-class Guatemalan coffee. Corn, beans, rice, pork, beef, chicken, cheese and tortillas form the backbone of most Guatemalan cuisine. Meat stews (caldos) and soups (sopas) are easily the most popular dishes among locals. If you order roast chicken, don't be startled if your Guatemala meal comes with the feet still attached (rare, but not unknown). 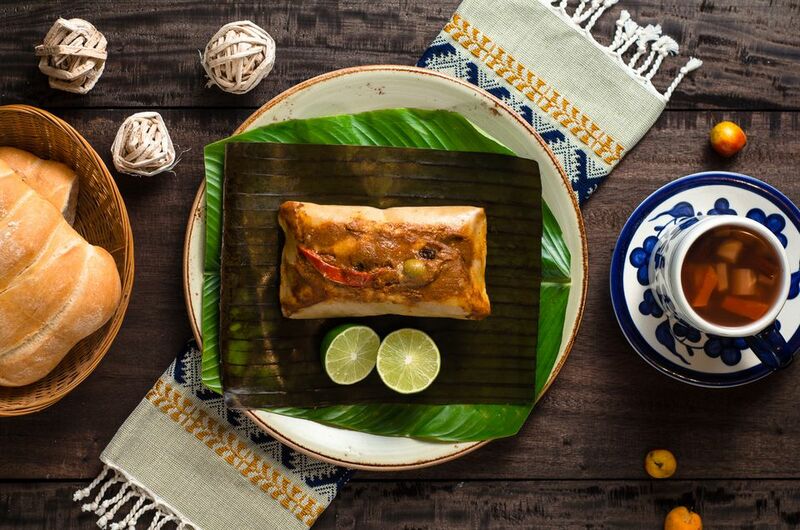 By checking out the menus you will discover that many meals in Guatemalan have similarities to those of Mexico, Guatemala's neighbor to the north. Guatemala food such as nachos, tamales, and enchiladas are just as delicious as you'll find in your favorite Mexican restaurant – and much cheaper. Chinese food restaurants, pizza places, and fried chicken stands are also quite common in Guatemala cities and towns. Chiles rellenos: Chile peppers stuffed with rice, cheese, meat, and vegetables. They are served with tortilla and tomato sauce. Kak’ik: A traditional Mayan turkey soup, with spices like coriander, achiote, and chile peppers. A must-try. Guacamole: Served with chips, or as a topping to other Guatemalan food. Spiced mango: Sliced green mango, seasoned with chili and lime. Sold from street carts. Tortillas: Thin, flat corn cakes, a staple in Guatemala food. As cheap as five cents on the street. Nachos: They include all sorts of tasty toppings like cheese, refried beans, meat, cream, avocado and peppers, and almost always include fresh hot chips. Delicious! Elotes: Roast ears of corn with cheese, lime, chili, and butter or mayonnaise. Tres Leches Cake (Pasel de Tres Leches): This is a cold kind of dessert, a cake soaked in three kinds of milk, including evaporated milk, sweetened condensed milk, and cream. Guatemala is one of the most inexpensive Central America countries, and accordingly, Guatemala food is cheap. You'll only find U.S. prices in the most touristy destinations like Flores and Antigua Guatemala; and even there, less pricey options are broad. Small eateries offer the best and cheaper options. International restaurants, cafes and coffee shops are common in well-trod areas. However, local eateries and street vendors are the best places to try authentic Guatemala food (and less authentic, like fried chicken and french fries). Just remember the traveler's mantra: wash it, peel it, cook it or forget it.